Referring to the process by which he studied Cuban democracy, August explicitly refers to it as “ethnographic research” (p. xiii). This is an important point, because he was trained as a political scientist in Montreal, but he is producing the kind of book that no anthropologist has offered, and yet could have. Given that fact, I have incorporated the text as required reading for the past two years in my course on Political Anthropology. Taking advantage of the fact that August is a fellow Montreal resident, he has kindly come twice to present guest lectures and engage in question and answer sessions about his book. He is an engaging speaker who thoroughly enjoys students’ questions and comments. Continuing with the note on anthropology and ethnography, August’s work has also been of critical importance in my course given the focus in the course on challenging the deeply held, taken for granted assumptions that (too) many of us have about our political system and the nature of other political systems–with a marked tendency toward self-praise, or at least complacency about our allegedly superior ways. Thus Arnold August’s work follows on the heels of the seminal texts of another Canadian political scientist, the late C. B. Macpherson (1965, 1977), whose lectures and writings on “the real world of democracy” again pose critical questions that ought to have been raised by anthropologists. Macpherson was especially prominent not just in Canada, but also internationally in political science. “It is clear that the real world of democracy has changed. And it is probable that it will go on changing. We in the West are gradually realizing that the West no longer has a monopoly on civilization or world leadership. Old habits of thought die hard. It has not been easy to give up the assumption that the future was bound to go our way….Liberal-democratic nations can no longer expect to run the world, nor can they expect that the world will run to them. It is not easy to get used to this idea…”. (pp. 2, 3). Old habits do die hard, and it’s sad to see that dominant Western discourse since the end of the Cold War has regressed to a distant point before Macpherson wrote those words. Within 25 years of writing them, Francis Fukuyama would instead be writing the exact opposite of everything above, and all sorts of writers, of every political shade in the West, have internalized some or all of his liberal triumphalist arguments. August’s work, fortunately, helps to reanimate Macpherson’s thinking and to deepen it both empirically and analytically. “One such fact…is that democracy is not properly to be equated with our unique Western liberal-democracy, but that the clearly non-liberal systems which prevail in the Soviet countries, and the somewhat different non-liberal systems of most of the underdeveloped countries of Asia and Africa, have a genuine historical claim to the title of democracy…. “A second fact is that our liberal-democracy, like any other system, is a system of power….It is a system by which people can be governed, that is, made to do things they would not otherwise do, and made to refrain from doing things they otherwise might do. Democracy as a system of government is, then, a system by which power is exerted by the state over individuals and groups within it. But more than that, a democratic government, like any other, exists to uphold and enforce a certain kind of society, a certain set of relations between individuals, a certain set of rights and claims that people have on each other both directly, and indirectly through their rights to property. These relations themselves are relations of power…. What makes Macpherson such a refreshing thinker is that, a) he pluralizes understandings of democracy and challenges the Eurocentric conception of democracy as singular, absolute, and our invention; b) he reminds us that what we call democracy is still the exercise of power by the state over all of us, and that it maintains a basic socio-economic system whose character is not up for grabs (when is the last time you voted for capitalism? Globalization? War? ); and, c) that liberal democracy is a feature of liberal capitalism, a late one at that, using competitive political methods to bolster the competitive market. Understanding Macpherson would thus mean understanding the folly of trying to “export” liberal democracy (which, by necessity, would entail violence), and that it is neither universal nor applicable to other social systems. A one-party state did not mean the absence of different perspectives and disagreements: this is where Macpherson turned his attention to intra-party democracy, and the mechanisms in place that allowed for broader input in decision-making, in selecting leaders, that made membership open, and where the “price” of participation did not involve an unreasonable amount of extra activity than might be expected of the average citizen (Macpherson, 1965, p. 40). What was distinctive about one-party states in Africa and Asia, contrasted with liberal-democracy, was that they did not privilege class and individualism. Given that “the ideal of liberal-democracy is consumers’ sovereignty” (Macpherson, 1965, p. 48), where politics is marketed as the exercise of consumer choice, democracy is reduced to means. In other democracies, democracy is about the production of certain outcomes. Thus just as Macpherson recognizes the plural diversity of democracies, he also brings attention to democracy as defined by certain ends, what would otherwise be called social and economic democracies with a just and egalitarian distribution of wealth and collective control of resources. In other words, we therefore have democracies in multi-party, one-party, and (after Machpherson wrote) non-party states (such as Libya when Muammar Gaddafi was leader). We have democracies that are capitalist and individualist, socialist, and nationalist. We have democracies that are about methods (elections), and democracies about outcomes (national independence, collective socio-economic rights). Democracy does not mean the absence of power, or the absence of elites or vanguards. Democracy does not mean the presence of elections. These are absolutely crucial points to learn, especially given the nature of contemporary imperialist discourse. The Real World of Political Anthropology? Political anthropologists have not been at the forefront in producing works demonstrating and explaining the diversity of recent and contemporary state-level democratic systems, in a global and comparative framework. Put briefly: we did not produce a C. B. Macpherson. Contrasted with Macpherson, the only spectrum of different systems of democracy that could be produced by Aihwa Ong was as follows: “advanced liberal democracy, parliamentary democracy, electoral democracy, socialist democracy” (Ong quoted in Paley, 2002, p. 471). We don’t know what “advanced” liberal democracy is supposed to mean, and how it is distinguishable from parliamentary and electoral democracy–or how socialist democracy is distinguishable from parliamentary and electoral democracy. Taken by itself, this may not inspire much confidence. Paley does however refer to a sample of studies that have begun to raise some of the same sorts of questions raised decades earlier by Macpherson (Paley, 2002, pp. 474, 475-476). To hers I would have added Bailey (1969) and his work on factions, especially since “in states in which there is only one legitimate political party, as in communist China, factionalism may simply serve the functions of party politics” (Lewellen, 2003, p. 105)–which takes us close to Macpherson’s understandings of intra-party democracy. Nevertheless, Paley herself feels at ease in using the term “dictatorship” (and the related phrase, “transition to democracy”) as if such notions could be suddenly divorced from the sort of debate in which Macpherson was fully engaged–that what we in the West call “dictatorship,” is often symbolic of our own Eurocentric cultural and ideological biases, rather than a simply “objective” analysis of reality. Where “transition to democracy” is concerned, I worry very much that we replicate linear evolutionist discourse of the kind we had around “pre-state” societies. As for Macpherson’s work, it is not even cited once by Paley (2002), though she refers to the works of other, lesser known, political scientists on occasion. On the other hand, Paley can be thanked for having animated the discussion of democracy in US anthropology, and for carrying her work further in organizing knowledge on the subject as it is being currently developed. Saying we have no Macpherson (nor an August for that matter) in anthropology, does not mean that no anthropologists work on democracy as such–there have been numerous local-level studies focused on particular communities, movements, organizations, and processes, usually not transcending the level of a single state. The result of anthropologists remaining moored to a method that will not permit them to produce a broad analysis, as Macpherson’s (even with all of its flaws and gaps), means that we remain outside of this discussion, even when it means that others are raising what should be recognized as key anthropological questions. While membership in the American Anthropological Association, comprising both US and international members, comprises several thousand individuals, one study found at most five or six dozen working in areas related to democracy, but otherwise “little work on the topic of democracy specifically” (Paley, 2002, p. 470). I myself have a very difficult time convincing even a single anthropology student that this is an important area of research that should occupy their attention. These observations bring to mind something raised over five decades ago, in a political scientist’s exhaustive and deeply critical review of the state of political anthropology. In 1959, David Easton essentially came to the conclusion that political anthropology had little to offer because it had been “so tardy in transcending the ethnocentric limits of past political conceptualization” (Easton, 1959, p. 219), in projecting the dominant concern with coercion, with physical violence, and the legitimate use of force in defining the political. Arnold August’s text helps us to directly confront what in my Political Anthropology course I refer to as the global problems of “democracy”. The first contemporary problem of democracy that I would highlight involves the following tension: the word seems to be applied by Western leaders (and large portions of public opinion) ever more narrowly, clearly reducing democracy to a form of liberal-democracy alone, while what democracy means outside the West seems to diverge considerably. (That Western media are quick to pronounce this or that “regime” as “democratic” or “authoritarian” should not concern us too much: as Macpherson said, journalists are better acquainted with public relations than with democracy.) The problem then is that of ethnocentrism applied to classifications of political systems. The second problem involves the application to political theory of what anthropologists are very familiar with, that is, cultural evolutionism: here the reigning view among Western leaders and even many “civil society” activists, is that one can judge all societies as having the same capacity for our kind of democracy, and to deny them our kind of democracy is to deny their equality as human beings. This is a variant of the “psychic unity of mankind” thesis, which we can rephrase as “political unity”. Again, our system is placed at the pinnacle, at the height of human achievement. To go against this is to somehow suggest racism or condescension—that others are “not ready” for “democracy” (while dismissing what they did create). To consider “them” equal, we must consider “them” the same–a dangerous conflation that is yet another manifestation of the narrowing of vocabulary, and of minds, in Western discourse. Such a conflation erases history and culture, and replaces it with Western teleology. While diverse actors may espouse this view of the superiority and universal applicability of Western liberal-democracy, including many contemporary Western Marxists and other leftists—it is interesting that all share a common affinity, knowingly or not, with the thinking of Francis Fukuyama and his “end of history” thesis that Western liberal democracy has become “the final form of human government” (1992, p. xi). What purposes does democracy serve? What good are freedom of speech and freedom of association? When are they good? Why have them? Which rights are most important, or are they all equal? Who decides? In what context? Is democracy about means, or about ends? Is it ever a good idea to not have a democracy, however defined? From my personal standpoint, I confess some doubts: I doubt the wisdom of other nations having to defend and justify their endogenous political systems in terms that Westerners might understand, by adopting some variation of the “democracy” label. To me this unnecessarily concedes ground. Arnold August’s Cuba and its Neighbours is in many ways a direct and detailed response to standard US charges that the nation is run by a dictatorship, at best a one-party state (that also commonly–and wrongly–implies an absence of democracy). Let’s turn and look at the political system from which such charges emanate to understand what North Americans typically mean by “democracy,” which is usually done by way of a self-affirming reference to their own system. No wonder that now that the influence of corporations in US governance has reached a maximum, so has the state’s concern with secrecy become increasingly expressed by way of shrill threats, added to the prosecution of more whistleblowers than ever before. This invisible government, “rests upon the increased official secrecy behind which great decisions are made without benefit of public or even of Congressional debate” (Mills, 1958, p. 38). The question of elite dominance figured prominently enough (among scholars of diverse political inclinations), that even Raymond Aron used it as a means of distinguishing the social and political systems of the US and the USSR. The conclusion he drew was striking for its lack of the kind of celebratory propaganda that has become the custom today. Thus for Aron, the crucial difference between “a society of the Soviet type and one of the Western type is that former has a unified élite and the latter a divided élite” (Aron, 1950a, p. 10). “A major feature of this is the command of political organizations and institutions by close-knit social groups (families or familial dynasties, groups of kin, closed associations or tightly controlled interlinked networks of persons) for the purpose of the relatively exclusive control of economic resources and their distribution, these resources being vital to the existence of larger populations. For many theorists the state, throughout history and in its numerous manifestations, was born in such processes and continues to be so. Moreover, the oppressive power of state systems (e.g. the denial or constraining of human freedoms, the production of poverty and class inequalities) and the expansion of these in imperial form is a consequence of oligarchic forces”. (Kapferer, 2005, p. 285). In the same vein as the authors above, Mathieu Guerin’s study of the American Legislative Exchange Council (ALEC) shows how a coup has effectively taken place in the US political system, such that the corporate lobby wields real political power in drafting legislation and co-opting state power. ALEC is a so-called not-for-profit organization that brings together corporate representatives and state legislators—thus “marrying” both capital and the state, as Guerin explains. Behind closed doors, Guerin reveals, the representatives and legislators design and vote on model bills. Legislators then bring the model bills home to their respective assemblies and attempt to implement them. The corporate members of ALEC are, in this way, empowered to change citizen’s rights without interference from the federal government. By fostering close ties with state legislators, these corporations have the power to impose their vision of society without recourse to military or police violence. Guerin also investigates the connection between the character of gentrification in San Francisco and the bullying might of Silicon Valley’s ALEC-affiliated corporate technocracy. This case study demonstrates how capital co-opts the existing state structure as a mode of subjugation and repression. Guerin’s research concludes that ALEC is an organization that symbolizes a corporate imperium rooted in the rise of neoliberalism in the early 1970s and emerging within the established imperial state of the US. While the government of Canada may enjoy lecturing Venezuela, Cuba, and pre-coup Ukraine on the truth and merits of “democracy,” without any sense of irony, it’s wise to remember the structurally girded fallacies built into Western ideological and rhetorical uses of “democracy”. Even if democracy is reducible to a bundle of methods, any representative of the political system in Canada (whose features are shared by a large number of Commonwealth nations), ought to be quietly reserved when speaking about democracy in public fora. In this so-called representative, parliamentary, electoral, liberal democracy, the official head of state is an unelected monarch, a foreign one at that–nor is the monarch as entirely neutral and powerless as many people believe when referring to her as a mere figurehead. Even if she was only a figurehead, then again it shows how we value elite-imposed superficial symbolism in place of the people’s choice. Second, one of our two legislative chambers is the Senate, which is entirely unelected again, and Senators are appointed for life. Third, we have a system where one party can win a minority of votes, and yet secure the majority of seats in the House of Commons, thus able to rule without any checks by the opposition. Fourth, as in other “Western democracies,” executive power has continually increased as well. Fifth, given that there is no proportional representation, it means that one’s vote can literally be wasted and effectively count toward nothing. If the reader cannot see this as anything less than a rigged political system that creates an illusion of democracy, as being elitist to an extent that might make even a Mosca blush, then one is simply not being objective. We do not have democracy so much as rule by fallacy. Then there is the everyday experience of non-democracy, even anti-democracy. In the corporate oligarchic state, most workers go to work each day under the dominion of a corporate boss. For a minimum of eight hours each day, that workers knows no democracy whatsoever, and indeed knows its opposite: unquestionable dictates from an all-powerful elite. In fact, the worker is only entitled to democracy for the few seconds it takes to cast a ballot once every few years–hence Maurice Bishop’s mockery of Westminster democracy as a “five-second democracy”. Thus we have no real, everyday practice of democracy, even if understood merely as means, nor do we have democracy understood as outcomes. However, fallacracy is effective in blinding many to the nature of the system in which we live. Among newcomers to Canada who came from former or current socialist states, some claim they came to enjoy “freedom” — yet on stolen land, in a country that currently colonizes Indigenous people, where just up to a few years ago Indigenous children were forcibly taken away and placed in “residential schools”. They might be unaware that it was Canada that served as one of the major inspirations for the Apartheid system. But, some counter, there are no food shortages in Canada, “like in Venezuela,” and no rationing, “like in Cuba,” thus reducing the world to the quality of one’s shopping experience, and measuring the progress of a nation in terms of the stocking of supermarket shelves (like so many US “journalists” do). Except we do have food shortages: there is no food for those who cannot afford to buy it, and there is little for those who cannot afford much. That is an effective shortage, and it is caused by the unequal distribution of capital. There is also rationing: what you can have is effectively controlled by one of two types of official ration cards–one is the dollar, the other is the food stamp. There is also rationing of “organic foods” in supermarkets, confined to what look like First Class sections of high-priced goods–many products, few buyers. The message there is that good health is only for those with the dollars to pay for it. These are not trivial points. Among those turning to food banks in Canada, 11% of those are new immigrants to Canada (which might give “freedom” a different taste). Moreover, in a population of roughly 34 million, 2.5 million Canadians live without secure access to food. Over 1.2 million Canadian children experience hunger and live below the poverty line. In the US, over 20% of households, or more than 47 million people, rely on food stamps. Meanwhile, nations in Latin America and the Caribbean are the ones that have made the most progress overall in reducing food insecurity. Fallacracy is the production of an image of democracy where both the practice and outcomes reproduce inequality and restrict access to power. Fallacracy is mediated through language and symbolism, and works particularly well when sustained by belief. That belief is bolstered by pointing accusing fingers at alleged non-democratic others. Thanks to the work of Arnold August among others, we have plenty of reason to question such belief. Aron, Raymond. (1950a). Social Structure and the Ruling Class (Part 1). The British Journal of Sociology, 1(1), 1-16. Aron, Raymond. (1950b). Social Structure and the Ruling Class (Part 2). The British Journal of Sociology, 1(2), 126-143. August, Arnold. (2013). 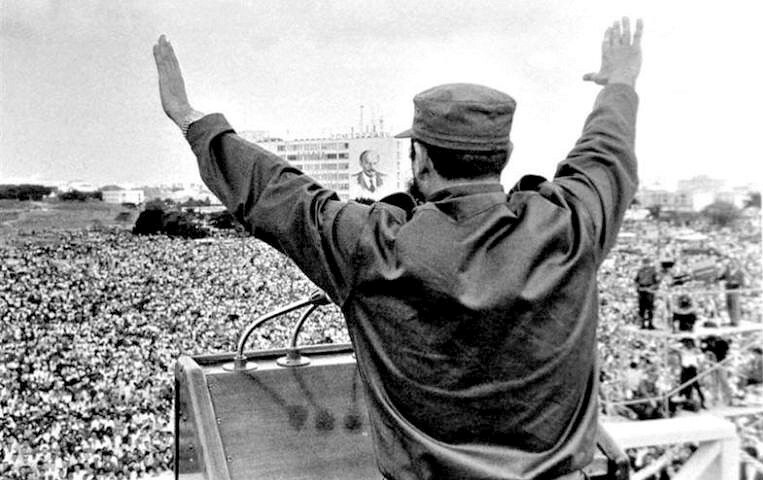 Cuba and its Neighbours: Democracy in Motion. London: Zed Books. Bailey, F. G. (1969). Stratagems and Spoils: A Social Anthropology of Politics. New York: Schocken Books. Easton, David. (1959). Political Anthropology. Biennial Review of Anthropology, 1, 210-262. Forte, Maximilian C. (2013). History Will Absolve Me: Sixty Years Later. Zero Anthropology, October 16. Gilens, Martin, & Page, Benjamin I. (2014). Testing Theories of American Politics: Elites, Interest Groups, and Average Citizens. Pre-publication draft for Perspectives on Politics. Guerin, Mathieu. (2014). Life, Liberty and the Pursuit of Wage Labour: The American Legislative Exchange Council and the Neoliberal Coup. In Maximilian C. Forte (Ed. ), Good Intentions: Norms and Practices of Imperial Humanitarianism (pp. 121-145). Montreal: Alert Press. Kapferer, Bruce. (2005). New Formations of Power, the Oligarchic-Corporate State, and Anthropological Ideological Discourse. Anthropological Theory, 5(3), 285-299. Lewellen, Ted C. (2003). Political Anthropology: An Introduction (3rd edition). London: Praeger. Macpherson, C. B. (1965). The Real World of Democracy. Toronto: House of Anansi Press. Macpherson, C. B. (1977). The Life and Times of Liberal Democracy. Oxford: Oxford University Press. Mills, C. Wright. (1958). The Structure of Power in American Society. The British Journal of Sociology, 9(1), 29-41. Mosca, Gaetano. (1939 ). The Ruling Class (Elementi di Scienza Politica). New York: Mc-Graw-Hill Book Company Inc.
Paley, Julia. (2002). Toward an Anthropology of Democracy. Annual Review of Anthropology, 21, 469-496. Paley, Julia (Ed.). (2008). Democracy: Anthropological Approaches. Santa Fe: SAR Press. Schumpeter, Joseph A. (2010 ). Capitalism, Socialism and Democracy. London: Routledge.